Saturday morning I booked time at PDHSC and shot the XDS. I was VERY pleased with the gun! Perfect fit! 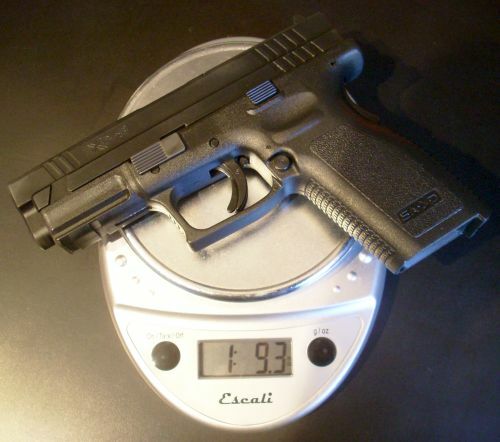 The XDS and my small hands. I’m committed to shooting only 9mm in a defensive weapon for now for budgetary reasons (lower cost of ammunition and I only need to stock up on one caliber). I was concerned that the smaller gun would result in recoil I wouldn’t handle well. I shot the same gun in .45 a few months ago and had a real problem with limp wristing. If I had that problem with the 9mm version I was determined to overcome the problem – but it didn’t happen. I alternated between the XD and the XDS and was pleasantly surprised to find I had better control of the XDS because I can get more of my hands around the grip. All my fingers fit on the grip with no need for the extended mag. The single stack design allows me to get a tight clamshell around the grip. The XD is wider. It forces my hands open and makes it much tougher to get a good clamping action. In fact, the XD “jumps” in my hand just enough that I constantly need to readjust my grip between shots. 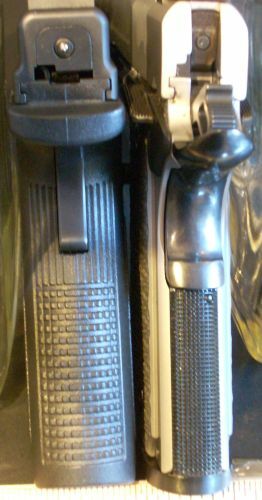 Like the 1911, the slimmer grip on the XDS gives me more control and no need for readjustment. I am used to loading via the slide lock release instead of racking the slide and I was concerned this would be much stiffer than my 1911. Once it was loaded and had a full magazine in the gun, it only required a light touch to release the slide. The magazine release button is tight. I did struggle with that but I think with some use or a break in period it will be easier to work. The sites are different than any of my other guns. It has the option of red or green optic front sights with white dot back sights. I’ll need to spend some time shooting with these to determine how I like (or dislike them). Based on how I shot the gun and the ease of recoil control I’m very excited about this gun. I see a BUG match and experiments with carry holsters in the near future. Leverage your friends, they have cool guns too! Sunday I agreed to go shooting with a friend I haven’t seen since I before I started shooting. He saw me on the news in an interview done by the local station and he reached out. 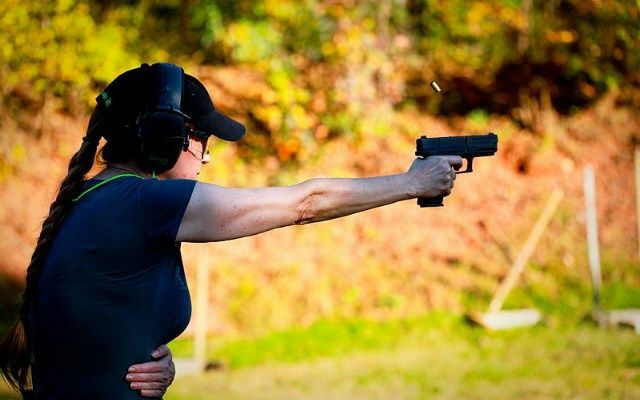 I never feel I spend enough time at the range and I didn’t want to give up my structured practices to hang out with someone I wasn’t even sure was safe with guns… so I procrastinated. Bad girl! Other than dealing with the chaos that is becoming normal on the weekend at a gun range, I had a good time. He has a nice collection of Springfield Armory guns. I let him shoot my 1911. 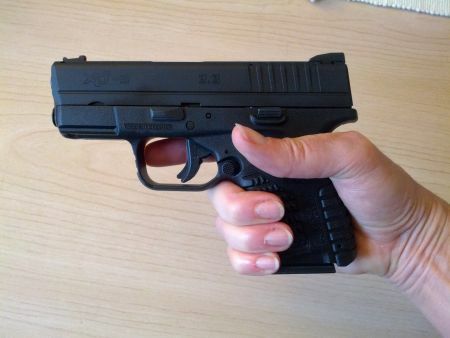 Until I had to admit that my XD9 was really too wide for my hand, I loved that gun. It’s simple to use, reliable, and simple to clean. I shot a .40 and .45 caliber pistol for the first time. Very manageable. 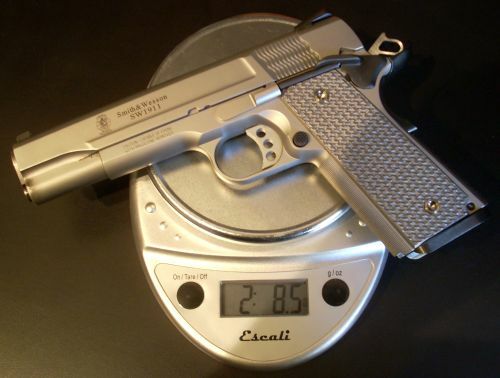 I bought a 1911 with a 5″ barrel to replace the XD9 as my competition gun but haven’t yet bought a carry gun because there are just too many decisions to make and I don’t want to buy a gun I don’t end up liking and that I have not shot. I walked away from shooting with my friend with a slam dunk of a choice. He has a Springfield XD-S in .45 calibre. It’s small, it’s thin, and it’s an XD! It’s a bruiser to shoot but I felt that with practice I could manage it nicely. It never jammed for him. It did jam for me, but I think I must have been limp-wristing the gun. I made a decision early on that I wasn’t going to buy any more guns unless they were in 9mm. I don’t want to have to stock up on multiple calibers. My life, my decision. Word from the SHOT show is that Springfield will be producing this gun in 9mm in the spring. I want this one. Easy, easy decision. 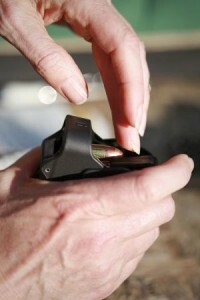 To make it even easier, holsters should already be available as the .45 holsters should also fit the 9mm model. Win! Now, I need to figure out how to get on a list somewhere to order this as I get the impression it will be popular.